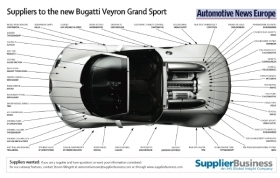 A division of BorgWarner Beru Systems GmbH, bf1systems, supplies the Bugatti Veyron Grand Sport's tire-pressure monitoring system, which alerts drivers if the tires deflate to a dangerous level. Because the car experiences such extreme conditions – with tires reaching temperatures of about 100 degrees Celsius (about 212 degrees Fahrenheit) and experiencing and forces of 2,900g (compared to 2,000g for regular automobiles) – a conventional TPMS will not suffice. Consequently, Beru supplies its DigiTyre TPMS, a carryover from its Formula One program. The Bugatti Veyron Grand Sport convertible features the same 16-cylinder, 1001hp gasoline engine as the coupe version of the supercar. Dana Holding Corp.'s multi-layer steel cylinder head gaskets seal the Grand Sport's W-16 powerplant. The gaskets, supplied by Dana under the brand name Victor Reinz, are made from spring steel (a very high-strength steel alloy) and utilize the firm's latest Wave-Stopper technology. This design allows the gaskets to maintain a complete seal at temperatures far higher than conventional units. Dana manufactures the gaskets at its German plant in Neu-Ulm, which is about 100km (about 60 miles) southeast of Stuttgart. Many other suppliers contribute to the vehicle's formidable powertrain, including Sweden's Haldex AB, which supplies the car's all-wheel-drive coupling; Bugatti Engineering GmbH and the UK's Ricardo plc, co-developers of the seven-speed supercar's dual-clutch transmission, which features a dual-clutch module from BorgWarner Transmission Systems; and Germany's Hoerbiger Antriebstechnik Holding GmbH, which delivers the Bugatti's synchronizer system.